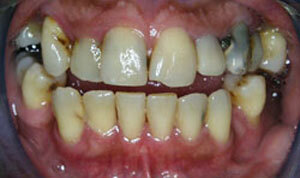 Before After This patient presented with old, stained bonding on her upper teeth. She had extensive facial trauma as a child. She was unhappy with the uneven length and crowded appearance of her front teeth. For sixty years she finally felt it was time to have the smile she always wanted. 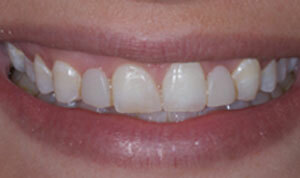 We started treatment with whitening trays for the upper and lower teeth to remove stain and brighten her natural teeth. 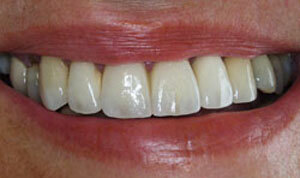 The old bonding and crowns were removed and esthetic crowns and bridgework was placed. 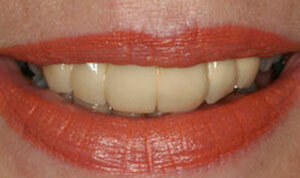 This was a beautiful result that corrected her dental appearance for tooth shape, contour and natural color. She says it has truly changed her life. Before After This pateient was referred to our office for the reputation for the quality of esthetic dentistry we provide. 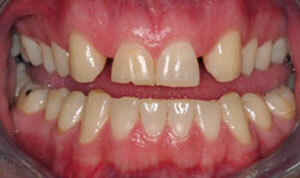 She had suffered for many years with bridgework on her upper teeth that was unaesthetic. The bridge was off at the midline, too long, and very yellow. She was very concerned on how the old bridge made her look old. 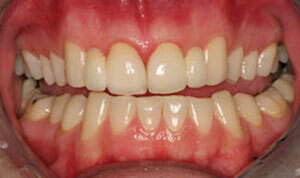 We started treatment with whitening her natual teeth to remove stain and brighten the teeth next to the bridge. With extensive digital photography and attention to detail, a new bridge was custom shaded to improve the shade and apperrance of natural teeth. Her friends and family feels she looks ten years younger. Before After This patient presented with a number of cracked and broken back teeth, as well as, cosmetic concerns regarding her front teeth. 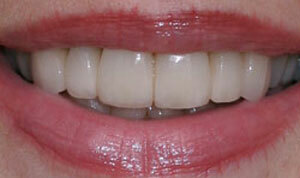 We restored her entire mouth with all porcelain crowns, metal-free bridgework, and CEREC restorations. With so much dental work needed, overcoming this patient’s initial fear and apprehension of dentistry was challenging. It is gratifying to know that her positive dental experience here has given her a new appreciation of dentistry! Before After This college student was referred to our office for a second opinion on replacing his upper lateral incisors that were missing from birth. 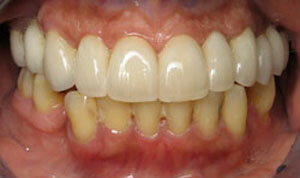 He completed orthodontics and was not a candidate for implants because the spaces were too narrow. The extensive wear pattern on his two front teeth and the limited space available for replacing his missing teeth made this case very challenging. We utilized state of the art metal-free, computer designed bridge frameworks with cantilevered lateral incisors to create a very natural looking all porcelain bridge. Before After This patient was referred to our office for a second opinion. She was very unhappy with his missing lateral incisors from birth. 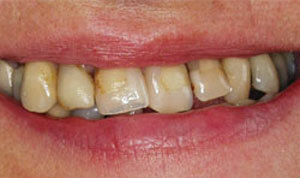 She completed orthodontics and was not a candidate for implants. The space was too small and narrow for implants. We discussed the extensive wear pattern on her two front teeth, need for length, contour and general shade. We utilized the latest metal–free computer designed bridge frameworks for his case. 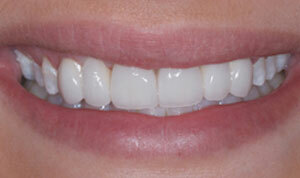 We whitened her upper and lower teeth to improve the shade foundation for the new esthetic all-ceramic bridges. 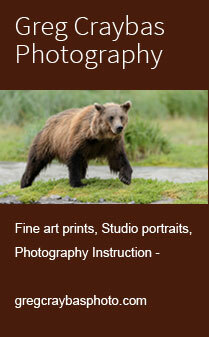 We took extensive digital photographs for custom shading to match perfectly to her natural teeth. The esthetic all porcelain bridges look wonderful.